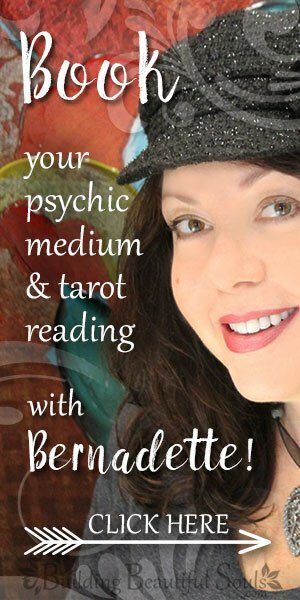 Tarotscopes – Monthly tarot insights for your zodiac sign! Sometimes it feels good to rest on your laurels, take a “selfie,” and dazzle others with your success! In this, the meaning of the Four of Pentacles tarot card is primarily that of material success and pride in one’s own accomplishments. It also shows a period of rest in which the cosmic energies have slowed to almost a complete stop. The castle and city in the background are symbols of prosperity and security. In the Four of Pentacles, the man in the royal garments is seated on a grey stage against a mostly grey backdrop. This color represents constancy, but it also shows that the flow of energy has stopped. Of course, the universe never grinds to a complete halt; after all, it is movement that keeps it alive. That’s pretty much what’s happening in the Four of Pentacles tarot card. Look at the man’s pose. Seated on a stone bench, his arms form a square, symbolizing earth, as he presents the pentacle, resting his chin on it. His feet also touch pentacles. Owning wealth is just as important to him as showing it off. Have fun with this moment, but don’t get stuck in it. Oh, and don’t make it a habit. Otherwise, people will mistake you for a shallow, materialistic poser – and that’s not who you really are, right? There is nothing wrong with letting others know how well you’ve done for yourself, as long as you remember that success is not only defined by money. True fulfillment requires more than material wealth. The crown in the Four of Pentacles is a symbol of power and authority. Notice that it is topped by a pentacle, meaning that this power depends on wealth. The man’s black cloak symbolizes stability, but also a preoccupation with material possessions. His red robe signifies passion and energy, and the robe’s azure hem is a reminder that he owes his wealth to the generosity of the universe. If the Four of Pentacles tarot card appears in your tarot reading, the universe is about to bless you with wealth. Wanting to hold onto it is wise, and there is no shame in showing it off. The question is: What else are you going to do with it? No one is expecting you to give it all to charity. Only you can decide what to do with what’s rightfully yours. 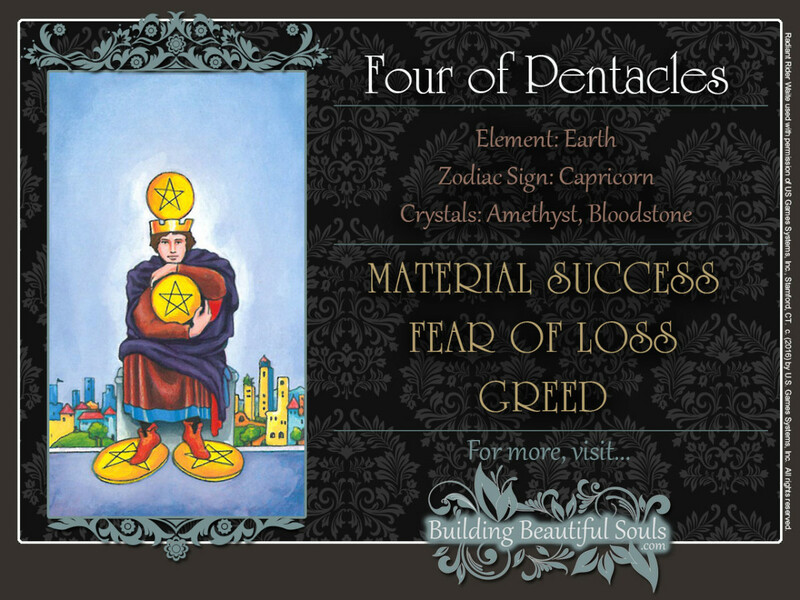 The Four of Pentacles tarot card is not a sermon-in-pictures about the evils of materialism. Rather, it challenges you think about using it wisely – and in a manner that allows you to grow as a person. Material security is the foundation for spiritual progress. The trick is not to get stuck at this stage. A sum of money is coming your way. It could come from an unexpected source or a business venture that is unfolding just as you planned. Standing on solid financial ground, the outlook for the future looks good, and your management skills are better than you think. Wanting to hold onto your gains is a natural impulse, but that doesn’t mean you can’t live a little. It’s okay to splurge here and there. You won’t overextend yourself. This is also a good way to start thinking about ways to have your money work for you. Yes, sewing it into your mattress is one way of always knowing where it is. What else can you do with it? Take some time to learn about different types of investments. After all, keeping your money sewn up in your mattress won’t help it keep up with inflation. There is no shame in taking pride of your accomplishments. In fact, it’s a healthy way to reward yourself for all the long hours and hard work you’ve put in. As long as you don’t overdo it, this allows others to rejoice in your success, as well. Don’t forget that the universe has blessed you with success so that you can open your eyes to higher spiritual truths. It is even bigger and more wonderful than the material joys with which it has gifted you. If the Four of Pentacles appears reversed in your tarot card reading, you may just learn that sometimes, the best way to handle the frustration of playing a seemingly never ending waiting game is to just let go. This may imply a radical step, such as counting your blessings and walking away, or it could mean that you have decided to drop long standing attitudes and hangups that have been holding you back for much too long. You’ll be pleased with the powerful sense of freedom. Things have come to a head, and you have arrived at the conclusion that business as usual just doesn’t cut it anymore. Taking stock of the pros and cons of your current situation, you realize that it’s time for a change – a big change. What’s holding you back? Have you become entrenched in negative thinking and behavior patterns or are you being stifled by external influences? If it’s your own attitude and perceptions that are keeping you stuck in the past, unexpected events will give you important insights. They will open your eyes and mind to new opportunities and creative solutions to old problems. It’s up to you to take advantage of them. Considering that you really don’t want things to go on the way they are, you have nothing to lose and much to gain. While it’s true that you control your own fate to a degree, everything is not your fault. With over six billion people on this planet, your personal karma is part of a much larger, universal karmic current. This means that the karma of others can very much impact your life. This is why there are limits to the extent in which you can change the dynamics of social interactions. Can you change this dynamic enough to satisfy your needs, or do you need to leave this situation altogether? Your decision will both empower and liberate you. On the Tree of Life, the Number 4 is associated with divine mercy and the planet Jupiter. As the ruler of the Greco-Roman gods, Jupiter is known for his generosity toward those who do good things. However, he is also known for his overindulgence in physical pleasures. Learn more about the sacred divinatory art of Numerology. Use our Numerology Calculator to find what your Life Path, Soul, Personality, Compatibility and Career Numbers are and how they can help improve all areas of your life! Copyright 2019 © Building Beautiful Souls, Inc..